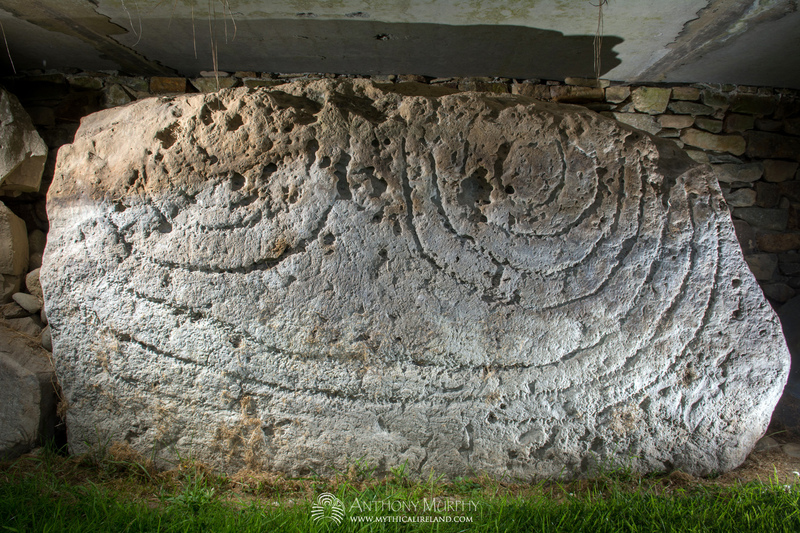 This is kerb stone 78 at Knowth, located not far from the entrance to the western passage. It is one of 127 kerb stones at Knowth, of which 90 have megalithic art. But what do these symbols represent, if anything? Are they merely art for art’s sake? American artist Martin Brennan published a book called The Stars and the Stones in 1984, having studied and drawn the megalithic art on almost all of the known decorated prehistoric stone sites in Ireland. 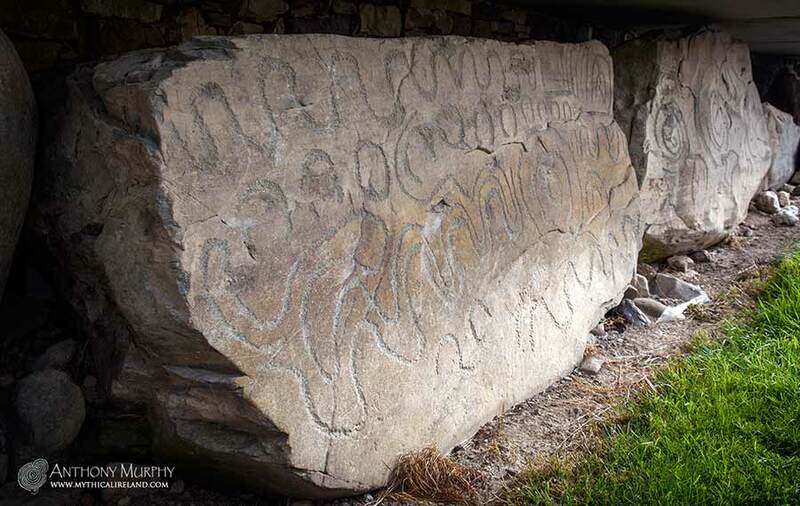 Brennan’s overall supposition was that the ancient engravings at Neolithic sites such as Newgrange, Knowth, Loughcrew, and many others, were related to astronomy. His book was later republished as The Stones of Time. At critical times of the year, the rising or setting sun projects beams of light into the inner chambers of the mounds, illuminating specific images carved on the stones. Those images – seemingly abstract wheels, spirals, and wavy lines – suggest provocative new insights into their makers’ understanding of celestial cycles and the importance of those cycles in human affairs. Brennan’s interpretation of kerb stone 78 (which he labelled as stone NW4 in his own personally devised numbering convention) is that it contains a diagrammatic representation of the moon through the use of what he calls “bijections or one-to-one correspondences with the phases of the moon”. 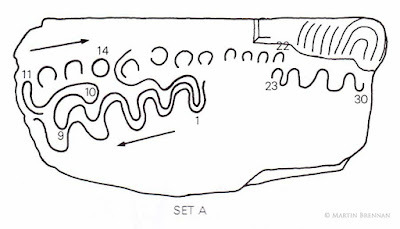 Brennan suggests that lunar imagery predominates on the kerb stones on the western portion of the great kerb of Knowth, where the crescents and arcs that dominate the imagery were generated by an interest in the moon and the division of time long before the age of mechanical clocks. The crescents, waved lines and circles on Kerb 78 represent the phases of the moon, according to Brennan. A ribbon-like development of the wavy line extends from the central image. The line follows a sequence shaped to fit the lunar month. The wavy line is transformed into crescents and then a full circle or full moon on the fourteenth count. A line divides the rest of the month, towards the end of which the crescents revert to the wavy line at the last quarter, defining a month of 30 days. He proposed a second way of ordering the month using a different interpretation of the symbols. The top line counts from the first day of the moon as far as the seventeenth day, which is the day upon which the moon begins to wane. The sequence continues at the bottom of the stone, as far as day 27 and the last visible crescent. A final three-count wave represents the three invisible days of the moon. Brennan's alternative lunar month count for kerb stone 78, Knowth. The number 17 is often treated with special significance in connection with the moon, he says. "It may have had significance in a calendar of ritual. Usually it is the seventeenth phase of the moon which appears on the horizon and projects a beam of light into the mounds." Brennan’s work is not without its detractors, and the analysis and categorisation of megalithic art has been an area of debate and dispute. 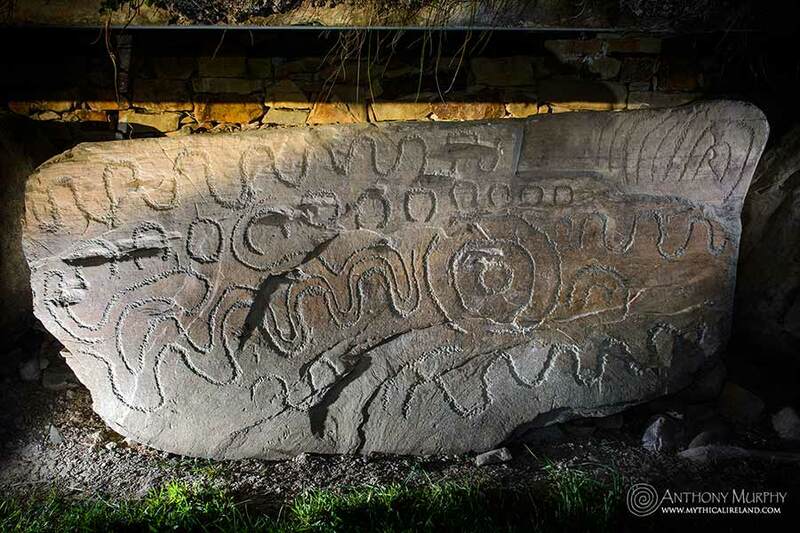 Some scholars argue that the megalithic art is abstract and non-representative. 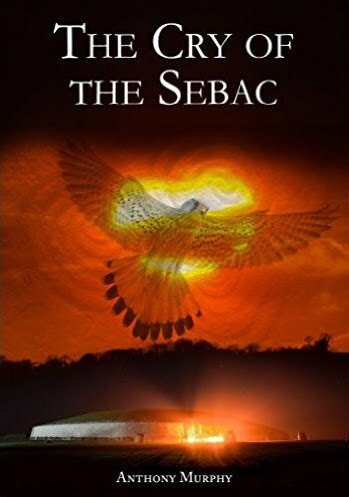 Brennan, however, develops a comprehensive thesis around the astronomical symbolism and, coupled with his team’s important discoveries at Loughcrew and Dowth*, it all makes for a fascinating interpretation. Kerb stone 78 at Knowth. * Brennan, along with Jack Roberts and others, discovered that the southern passage at Dowth is aligned so that light from the setting sun on winter solstice reaches the stones at the rear of its circular chamber. 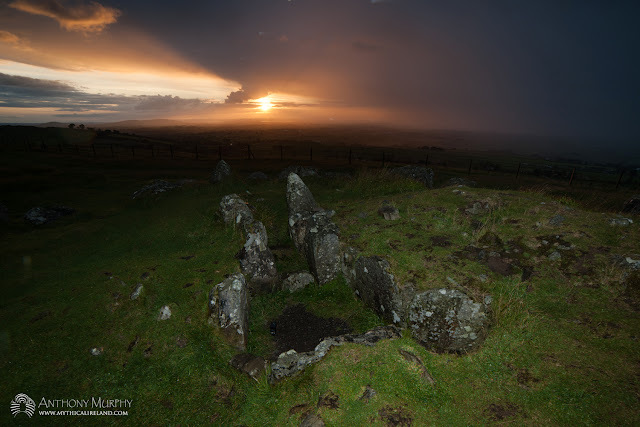 They also discovered that Cairn T at Loughcrew is aligned so that a stone with solar emblems at the rear of its chamber is bathed with sunlight at dawn on the vernal and autumnal equinoxes. 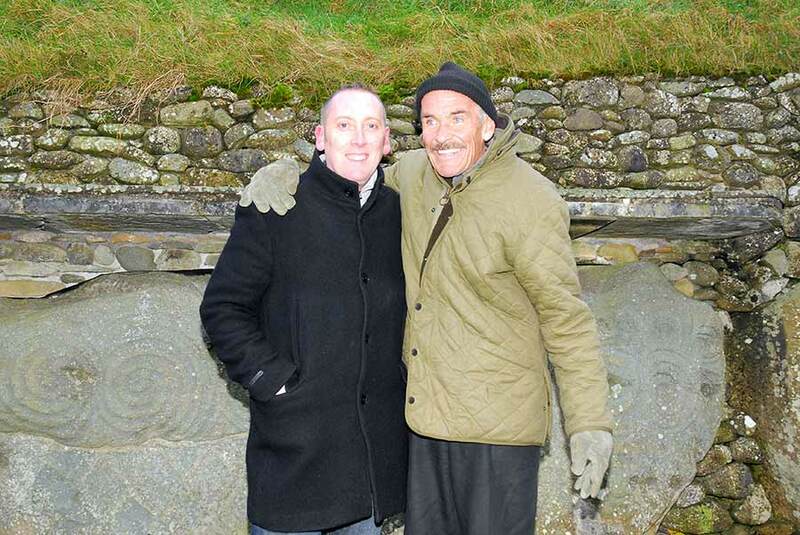 Anthony Murphy (Mythical Ireland) with Martin Brennan at Newgrange. Back in February of this year, at Imbolc, myself, Ken Williams and Lar Dooley witnessed the sunrise shining into the ancient passageway of Cairn U at Carnbane East, Loughcrew. That day, I noticed that when I was crouched in the chamber of Cairn U, the Hill of Tara was visible through the entrance of the passage. 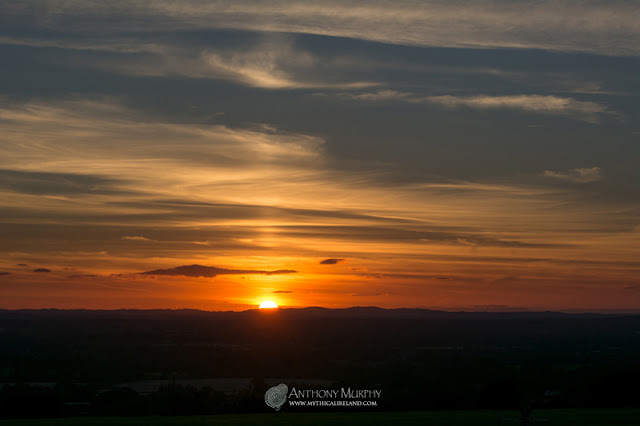 Based on that observation, I figured that a viewer on the Hill of Tara might see the sun setting over the hills of Loughcrew at Bealtaine (May) and Lughnasadh (August). The Loughcrew Hills viewed from Duma na nGiall, Hill of Tara, with labels. I was unable to get to Tara at Bealtaine, so I was determined to go there for Lughnasadh to see if I was right. 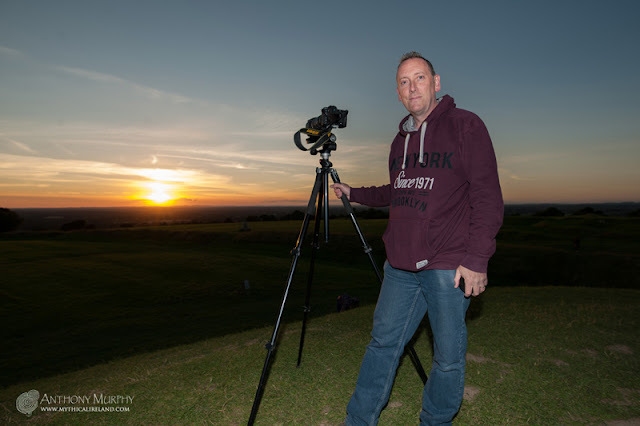 This evening, standing on top of Duma na nGiall (Mound of the Hostages) at the Hill of Tara, I watched the sun get lower and lower in the western sky with my son, Finn. Above is a photo showing the hills as they appear from atop the Mound of the Hostages. It looked like it was heading for Loughcrew, but I couldn't be sure. So I watched and waited. 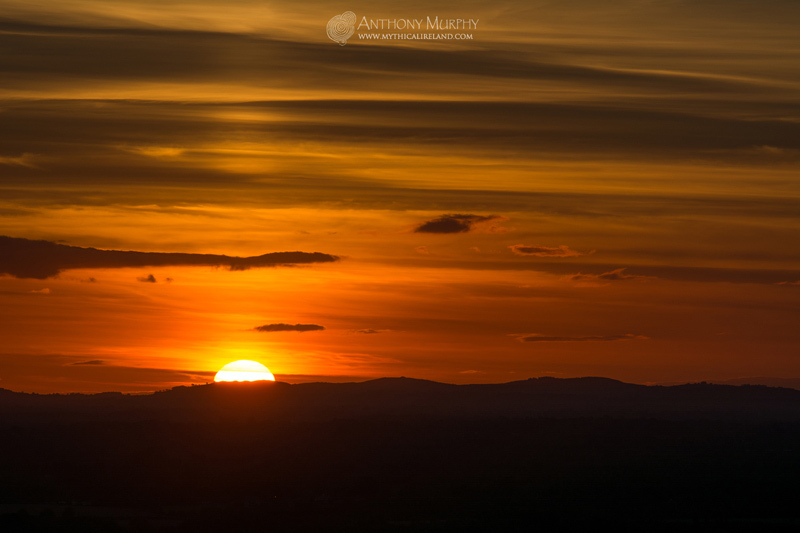 The sun setting over Cairn D, Carnbane West, and Carrigbrack, as viewed from Duma na nGiall. And sure enough, as the sun set, it did so over Carnbane West and Carrigbrack, which appear almost as one hill as viewed from Tara. It was a beautiful sunset, and as the sun went down there was a lovely sun pillar (a vertical shaft of light extending upwards from the sun) reaching into the sky. The sun pillar visible in the sky as the sun sets behind the hills of Loughcrew viewed from Tara. So it appears that Duma na nGiall, the oldest monument on the Hill of Tara which is thought to date to the late Neolithic, around 5,000 years ago, is aligned with Loughcrew for (a) sunrise on Samhain/Imbolc viewed from Cairn U Loughcrew towards Tara; and (b) Bealtine/Lughnasadh sunset viewed from Tara towards Loughcrew. The actual date of Lughnasadh this year was (I believe) August 7th, so the sun has moved a little bit to the south (left) since then. And I'm not sure how much the sun's position has changed at Lughnasadh from where it was 5,000 years ago. But it's would certainly appear that there is an alignment. Whether it was intended is another question entirely. But this is just one of many examples of alignments of sites over long distances. Seeing Tara framed by the ancient stones of Cairn U at Loughcrew in the cold dawn of Imbolc six months ago certainly was very fascinating to me. "This is hardly all coincidental," I said to myself. Indeed it might not be, but we may never know whether it was intended by the builders. All we can do now is watch and wonder. The author atop Duma na nGiall watching the sunset over Loughcrew tonight. Picture: Finn Murphy. Buí, the smiling hag of Knowth, perhaps? "Rock is the hag's prime element, her stony spine.... Cailleach time moves form moon to moon, harvest to harvest. It is pagan time, rooted in the eternal return rather than the once-off redemption." Seeing this stone again – known under the archaeologists’ counting system simply as Kerb 22 – I was struck at how much it seemed to look like a big smiling face with two bulbous eyes and a big, broad grin. These rocks were already eternally old when they were hauled into place - all 127 of them - to create a giant kerb or belt of stones around the gigantic mound that we know as Knowth. And now the carvings that were carefully etched into the surface of these slabs are eternally old, and the rocks that bear them speak of the beginning of time. Once upon a time, so the story goes, this great mound of stone and earth was known as Cnoc Búa or Cnoc Buí, the hill of the daughter of "red-haired Rúadrí", wife of Lug, son of Cian, of the ruddy spears. "It is there [Cnogba] her body was buried; over her was built a great hill." What shall we say about Buí today, except that she is remembered still, in these many aeons since her image was first conceived in stone, at the mighty Brug na Bóinde where the hag never dies. 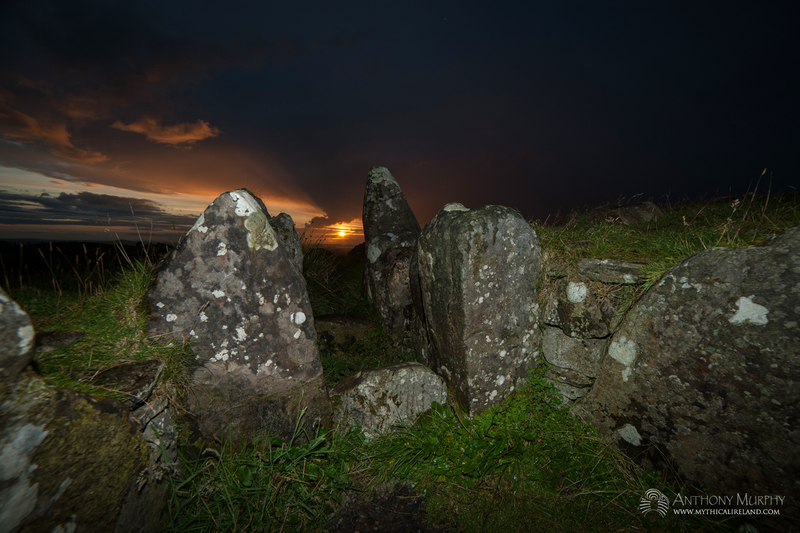 The hag's breasts are imagined as mounds in the Boyne landscape; her passage-wombs, creaking and groaning under the weight of the ages, live on to tell the story of the undying sons who were born there – Oengus the young, who was conceived and born in the same day; and Sétanta, whose crossing of the threshold of initiation brought him from innocent boy to murderous warrior. In there, Elcmar the magician of Brug na Bóinde, divined souls with his fork of white hazel; Dagda Mór, the Eochaidh All-Father, offered satiation to those who were crossing over; Oengus protected the beautiful Etaín from the jealous Fuamnach in his sunny, crystal bower. At ancient Cnogba, it is said that Englec the daughter of Elcmar was stolen away by Midir, much to the heartache of her lover, Oengus Óg. 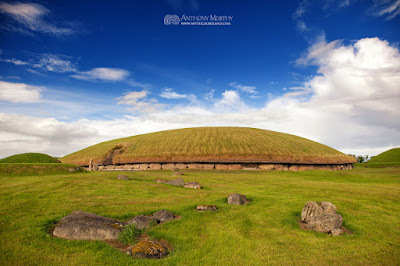 At Newgrange, Oengus had protected Midir’s lover Etáin, and yet at Knowth the two were love rivals for the woman Englec, whose disappearance was mourned greatly by the inconsolable Oengus. Mourning the abduction of his beloved, Oengus engaged in a curious ritual … casting the “blood-red nuts of the forest” on to the ground, and performed “a lament around the little hill”. Cnogba (Knowth) commemorates a goddess Buí and a goddess Englec. And so, in the confusion of tales so typical of the lore of the olden days, Knowth commemorates two distinct but perhaps not mutually exclusive events – both involving the passing (so to speak) of great women (goddesses even). As Cnoc Buí, Knowth remembers the great woman who was set to rest there beneath its heaving bulk, the undying hag of the ancient world who had many names and guises. As Chnó-guba (the “nut-lament”), Knowth commemorates the passing of Englec into another realm, swept away by Midir to the Síd of Fer Femin, never to be seen by Oengus again. Today, I stopped in front of stone 22 at Knowth during my round of the kerb (deiseal, sunwise, this time), and, having to stall a while under the modern concrete ledge to shelter from a summer shower, I imagined for a time that I was seeing the great women of Cnogba, the abiding visage of the ancient hag that was known here as Buí, and the darling Englec, the beautiful daughter of Elcmar. And I wonder which would endure longer – the memory of these great mythic women, or the stone carvings bearing this image. The earliest antiquarians who visited, documented, sketched and spoke about Newgrange sometimes get a hard time from the modern academic establishment. The writings of Lhwyd and Molyneux and Pownall and Vallancey are all criticised for one reason or another (poor Charles Vallancey is largely ridiculed, perhaps because he referred to Newgrange as a Mithraic temple). All of the early antiquarian accounts of the monument are valuable for one reason or another. Some of them have captured aspects of the monument that have disappeared since they wrote. Without the tools and techniques of modern archaeology, all of them were poking around in the dark, so to speak. They couldn't have known the true age of Newgrange, nor could they have appreciated the skills of the artists and builders who created it, those whom they all too often referred to as barbarous. Newgrange in its pre-excavation days. However, Dr. Glyn Daniel, lecturer in archaeology at Cambridge University and editor of the academic journal Antiquity, perhaps should have known better. 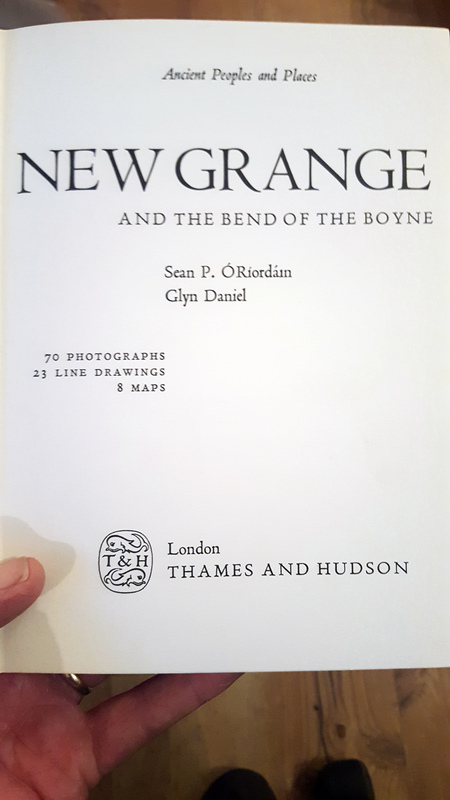 In 1964, Daniel's book 'New Grange and the Bend of the Boyne' was published by Thames & Hudson. It had been a collaborative effort with University College Cork professor of archaeology, Sean P. Ó Ríordáin. Sadly, Ó Ríordáin had passed away in 1957 in his early fifties, when the pair were only half way through completion of the book. Daniel was the General Editor of the 'Ancient Peoples and Places' series of books, under which the New Grange title was published. 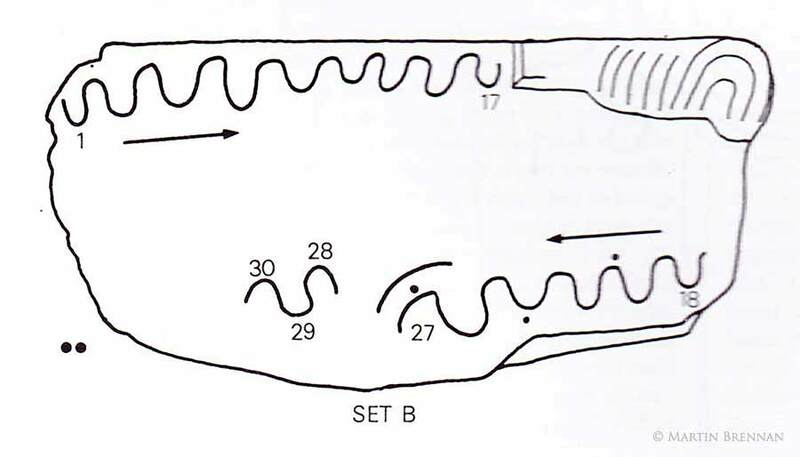 It was to become the largest single study of the Newgrange monument since George Coffey's 1912 book, and would be the last before Professor Michael J. O'Kelly's excavations at Newgrange revealed so many of its secrets. And in that foregoing paragraph, Daniel was just setting himself up for a fall. 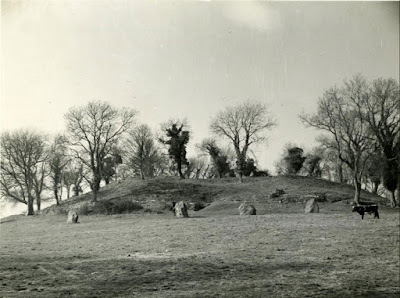 "The visitor to New Grange and Dowth will not be surprised to be told that these monuments were built by and were the homes of 'the little people' or to be asked their connection with the Druids." One should always be careful about dismissing the fairy folk – even if one is a leading archaeologist and "expert" of the times! The entrance kerb stone at Newgrange (K1). Two very important statements in this 1960 calendar demonstrate that there were enduring traditions about Newgrange that were fascinating and even compelling (and certainly worthy of at least some investigation) – one that the sun shone into the chamber during the year and the other that it was once covered with white quartz. Understandably, Daniel could not have known about the existence of quartz, given that the O'Kelly excavations at Newgrange had just begun when the Daniel/Ó Ríordáin book was published, but there was at least one possible reference to this feature in mythology – the "white-topped brugh" was said to have been "brilliant to approach". (2) If he had been a bit more familiar with some of the mythology of Newgrange, he might not have been so quick to shrug it off. Within three years or so of the publication of the Daniel/Ó Ríordáin book, Professor Michael O'Kelly would stand in the chamber of Newgrange and become the first person in the modern era (and perhaps since the Bronze Age) to witness the winter solstice sunlight streaming into its inner chamber, illuminating (by reflected light) the triskele or triple spiral in the chamber. During his excavations at the famous monument, O'Kelly would uncover a significant layer of quartz beneath the cairn spill material – quartz that he would later demonstrate through repeated experiment that actually fronted the monument. In other words, at the very least Newgrange had a white quartz facade, and it is not such a huge leap of imagination to envision the possibility that the cairn was once covered with this bright stone. One wonders what Daniel made of O'Kelly's revelations, and how it might have altered his thinking in relation to folklore. Folk memory is a very powerful thing. 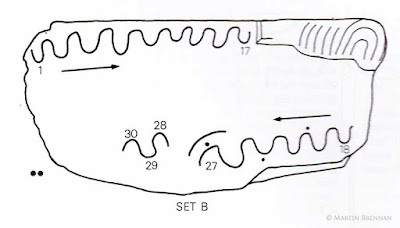 This might have been demonstrated in the case of the story in the locality of Newgrange suggesting that the Morning Star (Venus) shone into the chamber of the monument once every eight years, as recorded by Joseph Campbell in his 1959 book 'The Masks of God: Primitive Mythology"(4) Then there was the folklore collected in 1938 that suggested the Tuatha Dé Danann had built Newgrange using stones brought from the Mourne Mountains, another apparently wild and imaginative claim that had some basis in reality. Daniel allowed only one statement in the 1960 calendar to stand: "It is at least true in this strange wild-cat account we have just quoted, that New Grange might well be described as belonging to 'the very, very old days'." "It is our object in this book," he continued, "not only to describe the great tombs in the Bend of the Boyne but to set them in what appears to us their true prehistoric context, as far as the limitations of archaeology allow, eschewing the little people and Artemidoros". (1) Ó Ríordáin, Sean P., and Daniel, Glyn (1964), New Grange and the Bend of the Boyne, Thames and Hudson, p.19. (2) Murphy, Anthony (2012), Newgrange – Monument to Immortality, Liffey Press, p.114. (4) Campbell (1991) , pp.430-1. (5) MacKillop, James (1998), Oxford Dictionary of Celtic Mythology, Oxford University Press, p.177. (6) O'Kelly, Michael J. 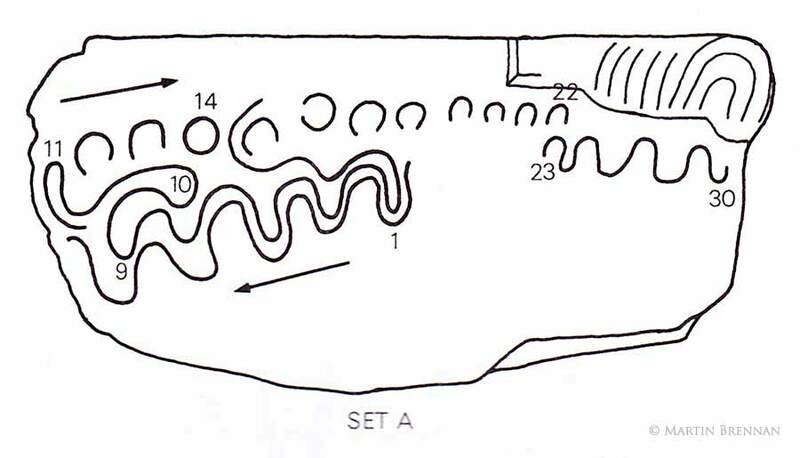 (1998) , Newgrange: Archaeology, Art & Legend, Thames and Hudson, p.47. Good morning from the Boyne Valley! 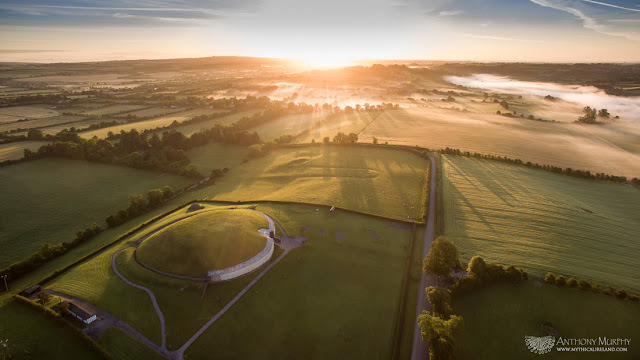 I'm delighted to share this beautiful photo of Summer Solstice sunrise at Newgrange/Síd in Broga (taken a few days after the actual day of solstice). In the story of Tochmarc Étaíne, the Wooing of Étaíne, there is an incredibly powerful image of Elcmar, standing atop Newgrange at Samhain in druidic garb with a fork of white hazel in his hand. Elcmar has arrived into the ownership of Síd in Broga through his power as a druid, and a poet, and a diviner. 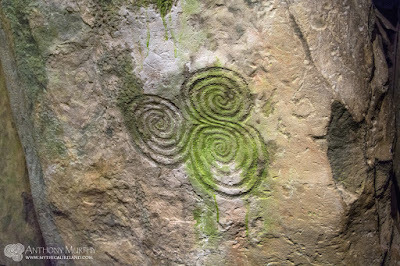 And this is the symbol that is all to often missing from the interpretation of Newgrange today. Today, it is called a tomb. It has become a dead thing. The image of Elcmar standing on the mound in all his power reminds us that the creative and intuitive side of our nature must not give way to the deadening image of the archaeologist's measuring rod. 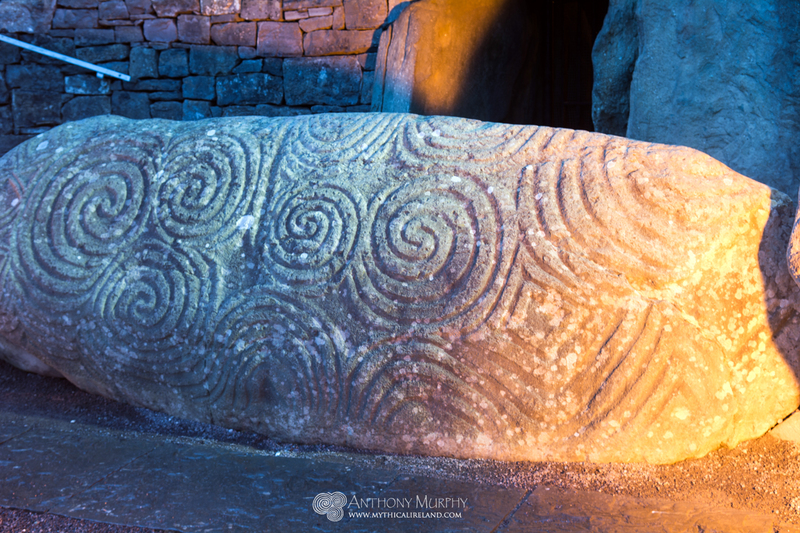 Yes, the archaeological interpretation of Newgrange is hugely important, and we are extremely grateful for all the light that they have shed on these wonderful ancient places. But they do not hold a premium on the interpretation of these sites. In ancient times, the poet held almost equal court in terms of status with the king. Today, we should allow the druid Elcmar to hold equal standing with the archaeologist. This means accepting that Newgrange has a power beyond what can be measured with a red and white pole. This means empowering aspects of ourselves that are hidden in the darkness of the sídhe, and shining that solstice light into the darkness to awaken something latent in us. We must allow our Elcmar nature to stand on the sídhe at Samhain. Without that inculcation, that instilling of the wisdom from within, Síd in Broga loses its power, and becomes just the New Grange, that heap of stones that once was a tomb but now is an empty vessel. And the real danger in depriving ourselves of our Elcmar image is that everything thus follows the same path - everything becomes inanimate and materialistic and our view becomes perhaps even nihilistic. Why are we here at all? The Meaning of Myth - the Fork of White Hazel. Anthony Murphy with Treacy O'Connor. Our Elcmar image allows us to stand in the power of our presence, in all that it encompasses - scientific and spiritual, awesome and terrible - and to engage fully with the journey of life. Thus, the childlike initiate becomes the supreme poet of the Boyne, the one who has tasted the Salmon of Knowledge. To the rationalist, the monument is called Newgrange, and it is a pile of stones from the past - the corpse of something it once was. To the poet, the monument is called Síd in Broga, and it is a crystal bower, a place where the sun eternally shines.